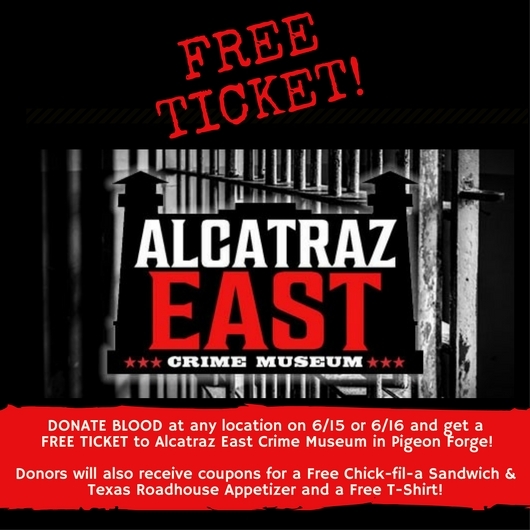 MEDIC Regional Blood Center is excited to announce a partnership with the Alcatraz East Crime Museum in Pigeon Forge! On June 15th and 16th, MEDIC will be giving each blood donor a ticket to the newly opened Alcatraz East Museum; a crime museum featuring an in-depth look at American crime history, which includes artifacts from lots of different eras and topics, not just the penitentiary on Alcatraz Island. The museum opened in December 2016. This partnership comes at a great time for MEDIC, as blood donations typically decline in the Summer. Blood Donors will also receive coupons for a FREE Chick-fil-a Sandwich, A FREE Appetizer at Texas Roadhouse, and a FREE T-Shirt!